Spring is an exciting time, full of the promise of things to come. Some vegetables are in season for such a short period that if you blink, you might miss them. It’s a great time to check out your local farmers market for these specialty veggies that aren’t typically grown for the mass-market. Today I decided to try two that were new to me, pea shoots and ramps. 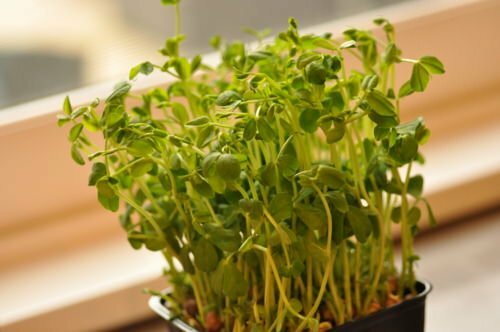 Pea shoots are the leaves and tendrils of the pea plant, sweet and crunchy, they have a nice subtle pea flavor all their own. You can toss them raw into a salad, or quickly saute them and add to your favorite recipes. 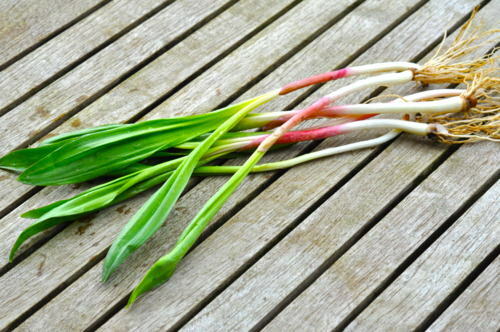 Ramps, otherwise know as wild leeks have beautiful flat broad leaves reminiscent of a lily and amazing pink stems. They have a pungent garlicky flavor that adds a lot of flavor to dishes. Today I decided to treat myself and cooked up a lunch for one. 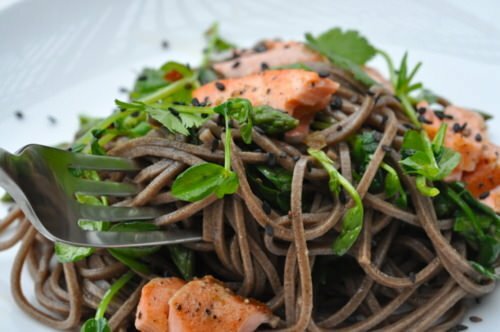 I boiled some soba, pan fried the ramps with some ginger, tossed in the pea shoots at the last minute and combined it with some fresh salmon and topped it all off with a soy sesame dressing. This dish really surprised me, I knew it would be a pretty dish but the taste really knocked my socks off! I had a hard time keeping away from the kitchen to help myself to seconds. This was the first time I had cooked with either ingredient and I’m already trying to figure out how to incorporate them into a few other dishes before their season is over! Most of the ingredients in this dish are easy to find in the asian food section of your supermarket. 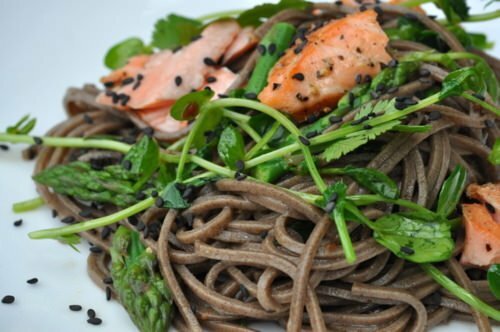 Soba noodles are made of buckwheat flour and are lower in calories and carbohydrates when compared to regular pasta. Sesame oil, rice vinegar and garlic chili paste are an important part of my pantry and I love the way they impart so much flavor and not a lot of fat and calories. Don’t be frustrated if you can’t find pea shoots or ramps you could easily substitute snow peas and green onions and it would be delicious. How about some spinach or chard? I hope that you take the time to make this dish even if some of the ingredients are unfamiliar to you. 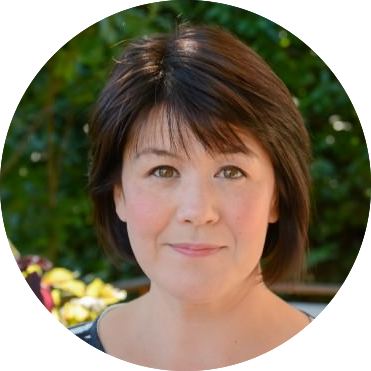 I get stuck in ruts and make the same few things over and over when there are so many great tastes out there just waiting to be discovered. So be a little adventurous, step out of your comfort zone and try this, you might just like it! Happy eats! Whisk the first 5 ingredients in a small bowl and season with salt and pepper. Cook soba noodles in a large saucepan of boiling salted water until tender but still firm to the bite. In the last 2-3 minutes of cooking add the asparagus to the pan. Drain the noodles, shock them in a bowl of ice water to set the color and stop the cooking process. Toss the mixture with half of the dressing a set aside to let the flavors come together while you finish the rest of the components. Heat oil in a frying pan over medium high heat. Sprinkle the salmon with salt and pepper and cook until browned but still pink in the center. Now this is the part that I ALWAYS mess up. I put the salmon in the pan and then start working on something else, next thing I know I have overcooked it! There is nothing more criminal (and disappointing) than to overcook a beautiful piece of fresh fish. So long story short, keep an eye on it! It should only take about 3 minutes per side and remember that it will continue to cook when you take it out of the pan. Meanwhile in the same skillet toss in the fresh ginger and ramps and cook until fragrant and slightly wilted. Take the pan off the heat and add the pea shoots, stir until they just begin to wilt and then toss the veggies with the soba. 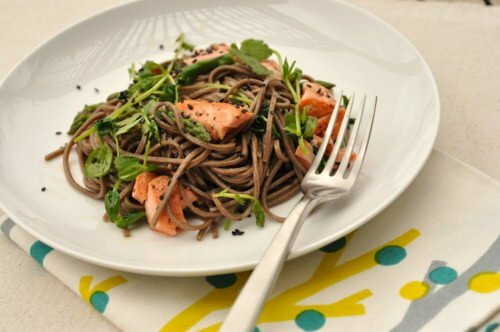 Divide the salad among 4 plates and then break the salmon into bite-size pieces and tuck it into the noodles. Sprinkle sesame seeds, cilantro and reserved dressing over the top and serve.